I’m thinking of having that sentence bronzed and put on my wall. 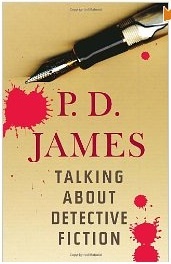 All the usual detectives are rounded up and put into perspective with wit and style, from Sherlock (“…the sitting-room was Sherlock Holmes’s office and the place where he received his visitors, which meant that Watson had to be banished to his bedroom when anyone arrived on business, which was not infrequently. It hardly seems a satisfactory arrangement.“) onward, and I am happy (and my banker relieved) to report that James is optimistic about the genre’s future. Yay, sister. She thinks e-books are okay, too, so there. Ngaio Marsh’s Roderick Alleyn series, in particular the ones set in New Zealand, Vintage Murder, Colour Scheme, and Died in the Wool.